The SmartNode 4130 series are the next-generation ISDN BRI models of the proven market-leading SmartNode VoIP product family. The available 2 or 4 port configurations fit the requirements of small and medium enterprises looking for a cost-effective way to bridge PBX systems on multiple sites or connect them to a public Internet telephony service. 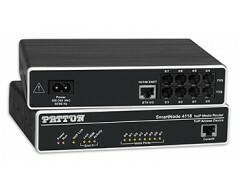 The ISDN port fallback relay solves many VoIP network integration problems encountered in real-world installations. By connecting a PSTN line and an ISDN PBX to the SmartNode, it is secured against power and SIP trunk outages. If available, the PSTN line can also synchronize the gateway. For applications without a PSTN line available the optional ISDN HP (high precision clock) provides an error-free ISDN data and fax transmissions. Like every Trinity SmartNode, the SN4130 comes with a built-in WEB Wizard for fast and easy configuration. You can build your own Web interface using the WEB Wizard functionalities.